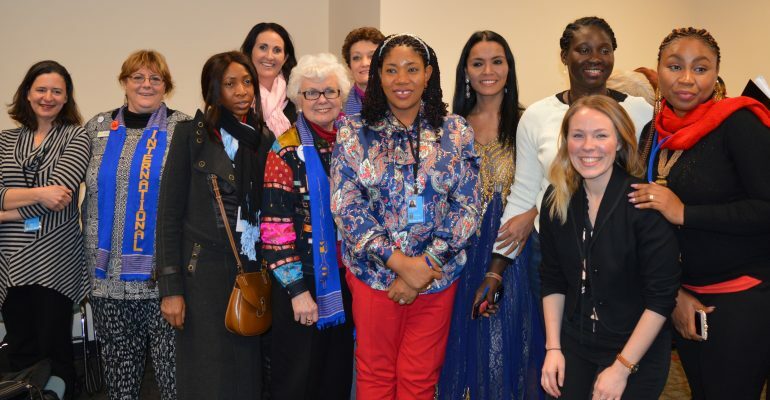 Thursday 16 March, and another fantastic day at CSW61. 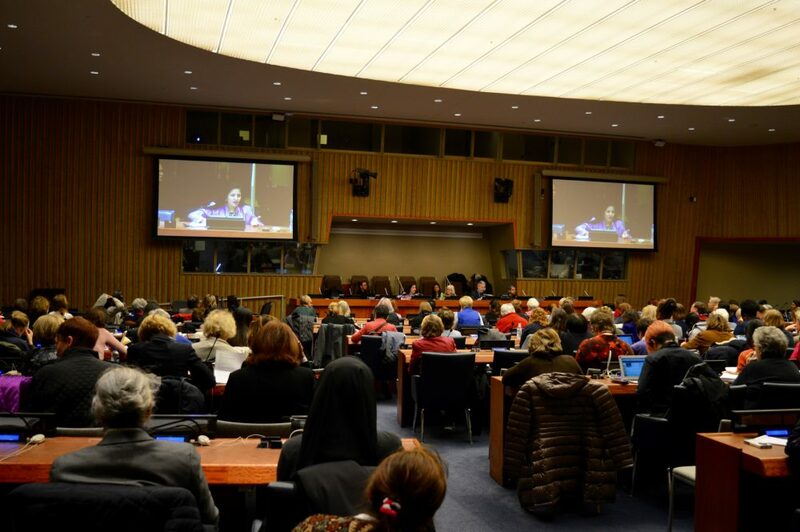 Following yesterday’s successful Soroptimist International event, Opening the Door to Economic Empowerment for Women and Girls (click HERE to read the story), today began with the Informal NGO Morning Briefing, organised by NGO CSW/NY with H.E. Ambassador Antonio de Aguiar Patriota, Chair of the Commission on the Status of Women and Lakshmi Puri, Assistant Secretary-General of the UN and Deputy Executive Director, UN Women. Ambassador Patriota noted that this year had seen an increase in the number of NGOs at CSW61 and he spoke of this years’ primary theme and how the subject matter helps us focus on key aspects and areas of concern. Whilst economic empowerment in the changing world of work is a goal in itself, it is also a channel and a bridge to the achievement of many other goals. 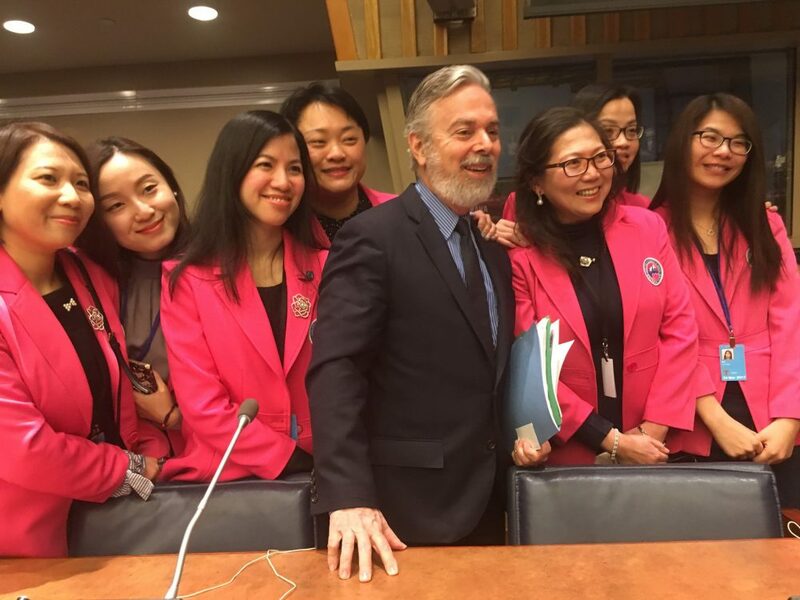 Ambassador Patriota, Chair of CSW61, following the Morning Briefing of NGOs, with a group of Hong Kong delegates. Ambassador Patriota said reality emerged from the round tables on Monday, showing real concern for the gender pay gap in the private sector. He spoke of task forces trying to establish better standards and formulas, as well as interesting ideas for incentives to give to businesses that meet high standards in achieving gender equality, such as seals of approvals, awards and possible champions of equal pay and work of equal value, within the industry. He said that alliances between NGOs and this sector were important. Ambassador Patriota said throughout his chairmanship it had been a pleasure to work with civil society, youth representatives, to further the engagement of men and boys and the HeforShe campaign, in the collective struggle towards an equal, just, prosperous and happy society. He believed that the topic would not loose significance in the coming years, because of the growing understanding of how this will benefit society. He went on to thank the attendees for their cooperation and their inspiration. At the Soroptimist Morning Briefing, Linda Witong, Consultant to SI Advocacy spoke of her work on the Soroptimist comments on the shortened text of the Draft of the Agreed Conclusions, now reduced to twenty-seven pages. The Zero draft on the main theme ‘Women’s Economic Empowerment in the Changing World of Work’ started with four pages in September 2016. Following comments of some 45 states/governments and multiple NGOs, including Soroptimist International, it exploded to some 79 pages. The afternoon parallel event It Starts With Safety: Adding Girls To The Global Agenda, stressed the necessity of conversation about the importance of youth leadership in achieving the Global Goals, and promoting the safety of women and girls everywhere. 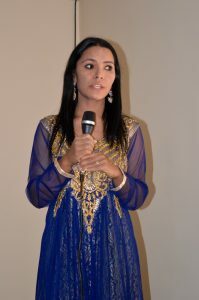 The event was moderated by Daniela Ligiero, Chief Executive Officer of Together for Girls, a global public-private partnership, dedicated to ending violence against children, especially sexual violence against girls. 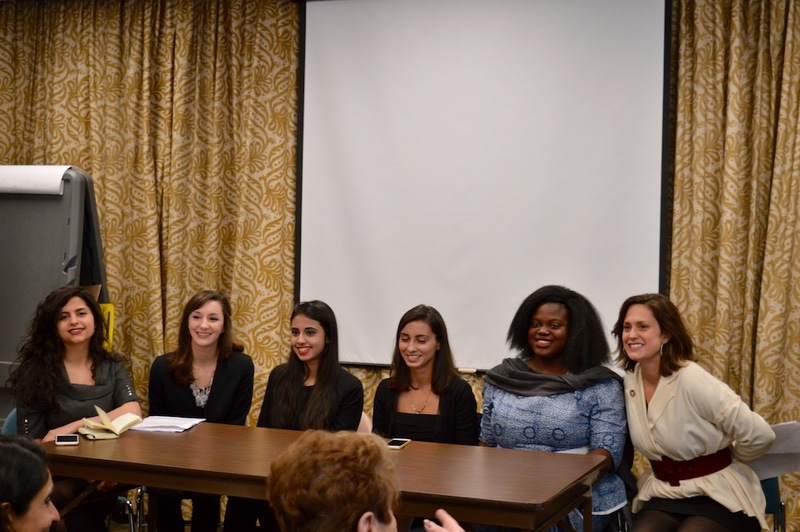 The panelists, all women, gave impressive presentations, notably Hamna Tariq, (third left), a gender activist and women rights leader in Pakistan. The speakers were Sandy Clark, Chief Development Officer, Sarah Webb, Program Director, Asia & Latin America and Dr. Usha Maharjan, Country Director, Nepal. Sandy introduced the DfG sanitary kits which have now reached over 300,000 girls. Each kit gives girls 180 days over the course of 3 years. Three years can make such a difference to a life; a girl will gain back 180 days of school; a woman will go 36 months without work interrupted and women and girls will regain their dignity. Dr. Usha talked of the situation for many girls and women in Nepal and her inspiration for joining Days For Girls; she talked of the beauty of Nepal and the Nepalese people, however she told us that menstruation was considered a curse, that women and girls were deemed ‘untouchable’ and she talked of a heinous tradition that sees menstruating women banished to a ‘shed’ with little ventilation, snakes, put at risk of death and “treated worse than cattle”. She told us her mother used to say “if you have stumbling blocks you can use these as stepping stones” and she believes that through education these women and men can cross the river of ignorance towards dignity and confidence. Sarah Webb spoke of the Enterprise model and the importance of self sustainability. 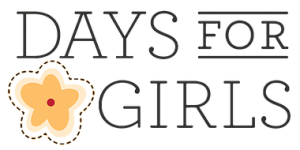 With 870 Chapters there has been an explosion of people around the world wanting to be part of Days for Girls and to help in some way. Chapters and Teams are the volunteer heart of Days for Girls and the force that has enabled them to reach over 100,000 women and girls in 75+ nations. All volunteer groups start out as Teams and these Teams and Chapters sew, raise awareness and funds, and facilitate transport kits to areas in need. A Center is the hub for a country and it is here that the DfG kits are made with local materials, and Trainers study their training programmes. 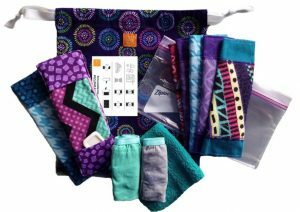 DfG Enterprises are groups that finish sewing pre-cut kits made by Centers, and sell them in their communities. Ambassadors are the final piece; these individuals support both their families and their communities by providing vital health information and by selling DfG kits. Donors ensure the model can be replicated anywhere, providing vital support, through sponsoring kits, making training possible, and ensuring Days for Girls has the team necessary to reach Every Girl. Everywhere. Period.